Engaged by the MetroHartford Alliance to develop a research-informed marketing strategy, we quickly realized members, known as Investors, craved a way to deepen their connections with other Investors, while the organization needed a solution for minimizing communication gaps between Investor classes. Needing a solution that was measurable, sustainable and supported Investor growth and retention, we conceptualized the Alliance Newsroom. Developed a members-only information hub that gives Investors the opportunity to hear what other Investors are doing, which is a business development opportunity for members. To meet the needs of media, the Newsroom includes a dropdown menu for contacts, divided by Alliance Initiative. Each links to a short bio and notes specific expertise for each designated spokesperson, allowing media to easily find contacts while on deadline. Since launching in late fall 2012, the number of Investor News submissions has steadily increased. The accompanying ‘The Daily Brief’ launched with a 60 percent open rate and a 20 percent click-thru rate. 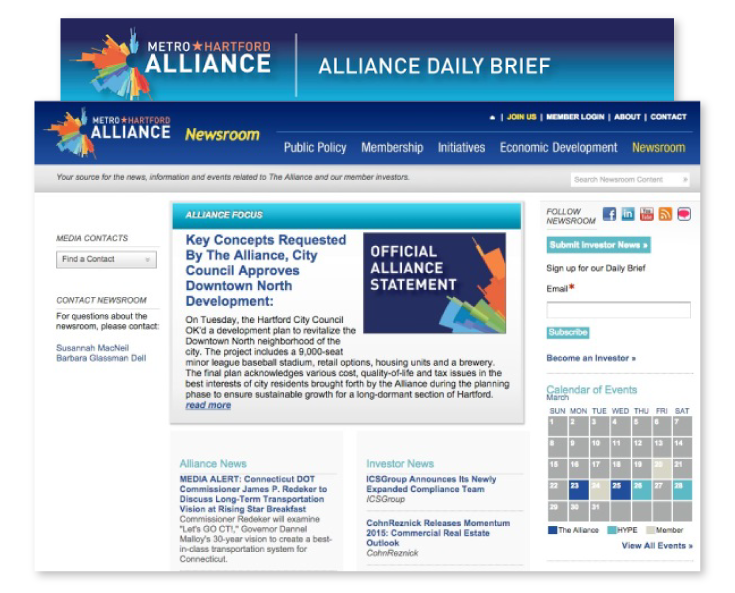 The Alliance was so pleased with the interest in the Newsroom, that it replicated the Investor News submission functionality for the Founding Partners of its newest initiative, The Connecticut Health Council. Co-Communications received a Gold Mercury Award from the Public Relations Society of America for the Alliance Newsroom.